Within 2 miles (3 km) of this well-placed hotel, you'll find Hampton Coliseum and Hampton Roads Convention Center. Peninsula Town Center and War Memorial Stadium are also within 3 miles (5 km). This hotel features an indoor pool, a 24-hour fitness center, and a restaurant. Traveling on business? Take advantage of the 24-hour business center and free WiFi in public areas. Free self parking, a lobby fireplace, and a picnic area are also offered. Featuring conveniences like refrigerators and microwaves, the 149 guestrooms offer free WiFi and free wired Internet, as well as LCD TVs with cable channels. Other amenities include room service, premium bedding, and coffee/tea makers. Pool was not open and this was the sole reason we chose this hotel. The property was well kept from the Front to Back. Floors were Clean through out the Day. Breakfast should be Included. Great experience! No worries during visit! I enjoyed my stay, this is why I choose Hilton hotels! Cons: It would be nice if there was included breakfast. Location: Central to military bases, not far from Williamsburg, Newport News, Virginia beach, etc. Clean, secure hotel centrally located. We had business in Norfolk, Virginia Beach and surrounding areas. This was well placed to reach these in a timely matter. Easy to navigate in and out of even with higher traffic. Maps on iphone was confused on the road system near the hotel and always wanted to send us in a loop to get to our hotel. Once we knew where it was, it was faster to get to. Very pleasant. I appreciate the water in the lobby. Coffee not served after breakfast. Lunch not available. Friendly and helpful staff. This way my fourth stay here and always happy. The staff is very polite and nice and the rooms are very clean and comfortable. The pool was really small and you share a parking lot with the hotel. The staff was excellent. Hilton Garden Inn Hampton Coliseum Central offers its guests an indoor pool and a 24-hour fitness center. There's a restaurant on site. Business amenities include a 24-hour business center and a meeting room. WiFi is free in public spaces. The business-friendly Hilton Garden Inn Hampton Coliseum Central also features a picnic area, coffee/tea in a common area, and complimentary newspapers in the lobby. Free self parking is available. This 3-star Hampton hotel is smoke free. 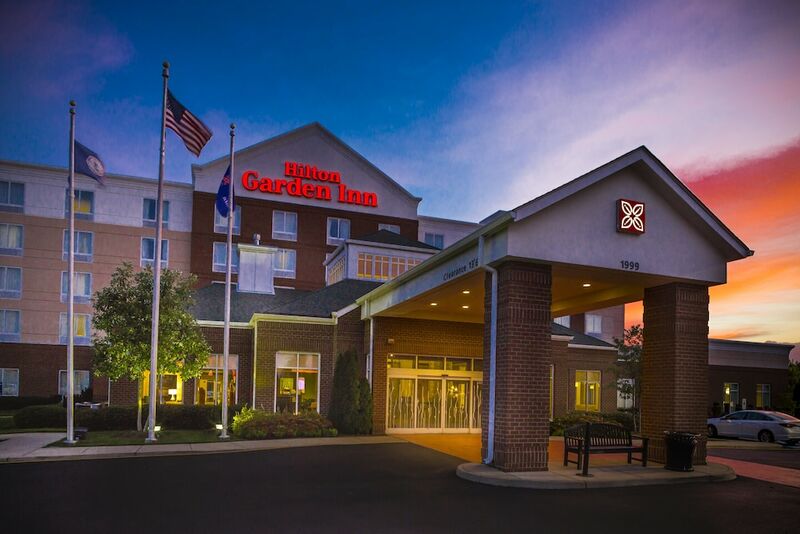 Hilton Garden Inn Hampton Coliseum Central offers 149 air-conditioned accommodations with coffee/tea makers and hair dryers. Beds feature premium bedding. LCD televisions come with cable channels and pay movies. Refrigerators and microwaves are provided. Bathrooms include shower/tub combinations and complimentary toiletries. Guests can surf the web using the complimentary wired and wireless Internet access. Business-friendly amenities include desks and phones. Housekeeping is provided daily.